The ongoing Destruct-A-Saur release saga continues! 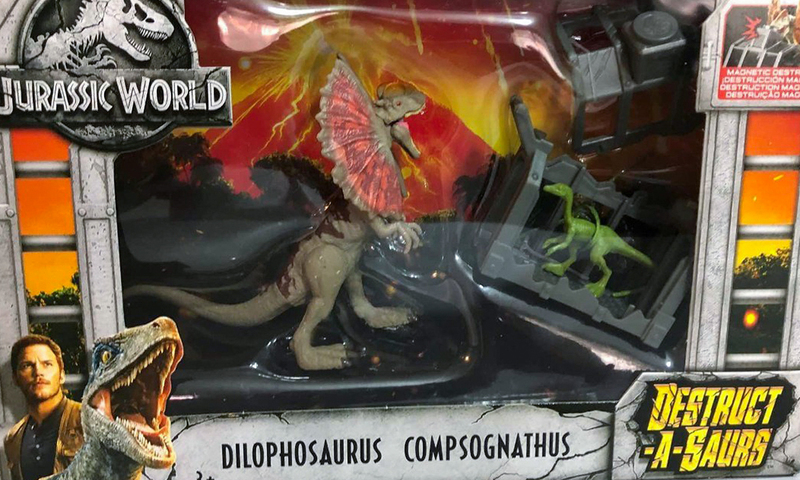 Several reports of Mattel’s Velocirpator, Dilophosaurus and Pteranodon sets being available for purchase in Toys R Us Canada stores surfaced this week, and it’s looking more and more like the troubled toyline might finally be coming “home” to the Canadian toy retailer. This Mattel Jurassic World toyline was originally planned as a Toys R Us exclusive, at least in the North America, before being unceremoniously “cancelled” for a US release after the toy retailer closed its doors here in March 2018. However, if the Jurassic franchise has taught us one thing its that dinosaurs are hard to kill. Sure enough, the Destruct-A-Saur basic assortment began showing up in various department and toy stores in Mexico as well as in other Central and South American countries. Before long, US Amazon pre-order listings also appeared and it seemed like the line had survived total extinction. While Amazon eventually cancelled the pre-orders, the Helicopter set was eventually sold in the US at and the T-Rex Ambush set in Canada. Now that more Destruct-A-Saur releases are finding their way to Toys R Us Canada, doe this mean we’ll see more from this “cancelled” toyline in 2019? A Dimetrodon, Stygimoloch, and at least one additional playset were originally planned before the shake-up last Spring. Take a closer look at the Destruct-A-Saurs releases in our Photo Feature of the toyline, and keep checking Collect Jurassic for more updates on Mattel’s 2019 Jurassic plans! Awesome news. Really hope the rest of this series will eventually be for sale here in the U.S. as I really want to get the rest of them. Any word so far if the remainder of this series will be available in the U.S.? They will not be coming to the USA. Britt Shotts confirmed as such. Damn :/ Hopefully they can still be imported for reasonable prices, at least. Hope so! Shipping from Canada is generally a lot cheaper than from Mexico, but it just depends. If these can be imported at a good price I’m all for it. I’m sure if they turn up online at good prices it’ll be reported as such on here, just like the Pteranodon and helicopter set, which was an amazing deal.